JxCDC is an Open Access IEEE journal. For more information about Open Access, please see below! SSCS publications are available on-line to SSCS members at no additional cost. Members: use your IEEE Web Account. For more information ABOUT the publications, use the navigation buttons on the left. 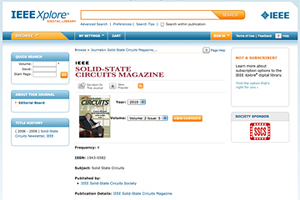 To access the home pages of these publications in IEEE Xplore use the links below. The most downloaded periodical IEEE hosts. All about fabricated integrated circuits that work. 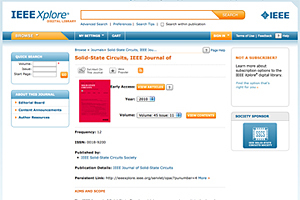 A self-contained resource for fundamental theories and practical advances within the field of Integrated Circuits (ICs).